Aren't there countless times when you happen across a toilet so amazing or so foul that you say to yourself, "Ach! Where is my camera when I need it?!" Me too! But in some instances I did have my camera and here, friends, is a wee TOILET PHOTO SPECTACULAR!! ...as I found myself stuck in a bus station in Qax, Azerbaijan with this toilet. I think I was wearing shoes this day, thankfully. If I had to use this wearing thin sandals, I don't know what I would have done. Nothing brings togetherness in the true socialist way than rubbing elbows with your fellow waste excreters. That's pretty close together I'd say. I asked a Chinese friend about this and she didn't want to talk about it, saying only, "You get used to it." I suppose a positive aspect is that in such close quarters the competitive juices flow. Let me add this: notice how clean it is? People that have looked at this toilet page have told me, "Wait until you get to China!" but I never saw a nasty toilet in one month there. On the other hand, I was on the more prosperous east coast and not inland where life is, uh, more colorful. This is in Beijing. I have just what you need: room 106 in the Traveler's Lodge on Jalan Muntri in Penang, Malaysia. I noticed this configuration when I first checked in. I asked to see another room and it had the same odd design but with less water pressure, making it more precarious. I used the common shower instead. This is not particularly uncommon in Southeast Asia. I call this Brady Bunch construction where the whole guest house looks like something the Brady kids would recklessly slap together on a weekend. I suppose that is the tradeoff: you stay in a rickety fire hazard of a guest house with wacked out plumbing and don't complain because you are only paying $4. This is room 3 of the Hotel Maria in Calcutta (Kolkata), India. There's not much to say about this. 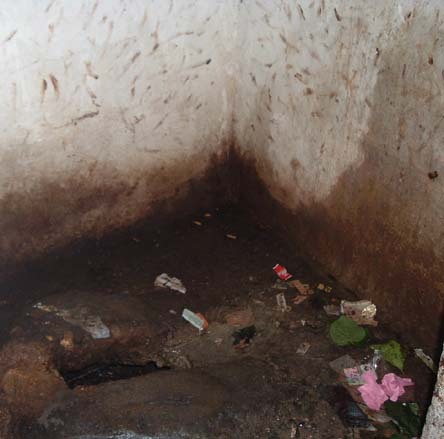 It is typical for a 100 rupee (US$2.20) room. This was my third time to India and it still makes me crazy. Everyone says, "You need to stay a month to get used to it." A month? I think if I was ever sent to prison I would expect to hear that from my fellow inmates. 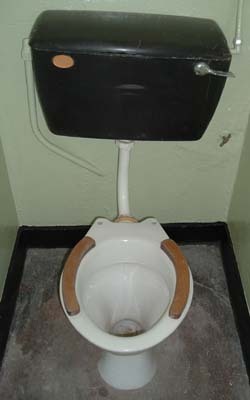 Square toilet in the Sharjah Youth Hostel, United Arab Emirates. Who would have guessed that the Arabs are at the forefront of mod toilet design? I took a second and third glance when I first saw this in my guest house in San Salvador, El Salvador, but it isn't what it appears to be. 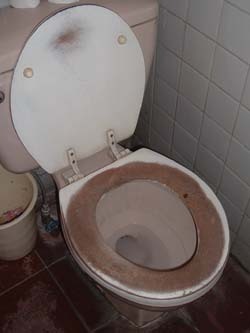 It is just normal wear, but why would a toilet seat have wear like this? I did sit on this after very careful inspection. I did several times, actually, always with a moment of trepidation. 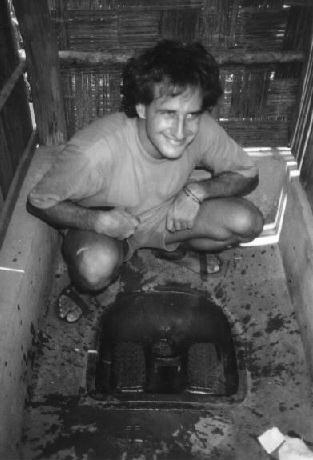 This toilet is in the back of the death boat from Phnom Penh to Siem Reap (Angkor Wat) in Cambodia. It is a very long, slender, enclosed boat with only one door way up in the front. If the boat turned over, absolutely no one would survive. I sat in the back in fear as the boat raced at ridiculous speeds in choppy waters. It was a rough ride, and my premature death seemed imminent. Given all that, I am surprised I am smiling in this photo. I must have tried to get my mind off the situation and I was struck by this toilet. To use this, one had to somehow shrink their body to get up on the pedestal, the low roof impeding your movement (I am bent over in the photo because the roof is right above me), and squat, all the while trying to keep your balance with the boat rushing and swaying seemingly out of control. Not optimal for the nerves. Here I am with a goofy look on my face in the decrepit Pension Victoria in Tangier, Morocco. This toilet doesn't look so bad, but the smell was quite powerful. I also thought I would show off my 2004 squatting technique. In all honesty I think I will be done traveling when I can no longer squat like this. This was a rest stop we made when we drove from Saigon to Nha Trang in Vietnam. (A day or two later I was in the hospital. See the story here.) This was at the end of a long, elevated walkway above a wide river. I could see that all the effluence was going straight into the river, but I wasn't prepared for the sight of a swarm of maggots swimming in the toilet hole. Beware of splashing water! The footwear is a bit more sensible here. 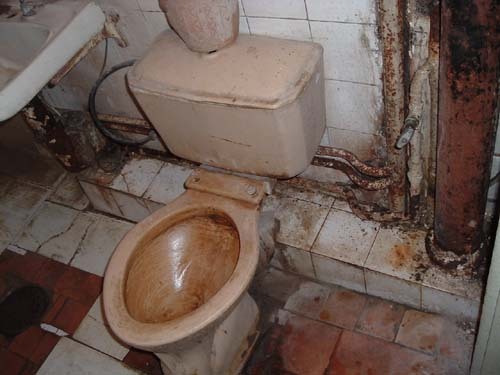 This quite possibly is the worst/saddest toilet ever in the history of personal hygiene. I was going from Tallinn, Estonia to St. Petersburg, Russia and this was a rest stop at a small bus station in Narva, Estonia near the border. When I saw this I had to race back and get my camera and try very surreptiously to take a photo without freaking out my fellow passengers. I managed to take this photo with flash and only one woman noticed me. She avoided making any eye contact with me the rest of the trip. I show the paper photo to people and they turn it around and around, not sure which way is up. It is quite stunning on many levels, isn't it? You can almost stare at the picture like it is an abstract painting and decipher many meanings and maybe the essence of life. 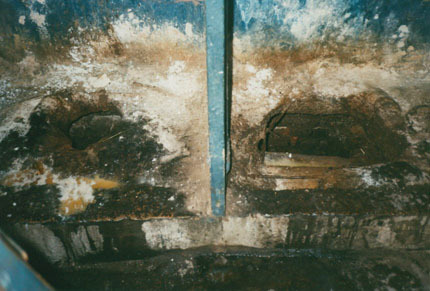 I am standing at the entrance and looking at two squat/pit toilets. There are no doors to speak of. From a practical standpoint this toilet was treacherous. Even though I only had to do #1, when I tried to stand close, the boards slightly buckled; it was wearing away. I felt the whole thing could give at any moment and I could be in the soup. Would that be a Pulitzer Prize-winning photo or what? 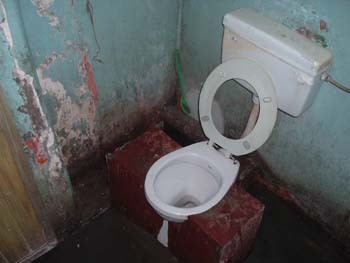 On another level, this toilet is interesting because in one sense it epitomizes the old Soviet socialist thinking. It is saying that we shouldn't be afraid to acknowledge that waste excretion is nothing to be ashamed of, so let's do it together out in the open and encourage each other. I can imagine people in years past gathering here, squatting in a row and chanting inspirational slogans. Let's take a moment to ponder that together, collectively. 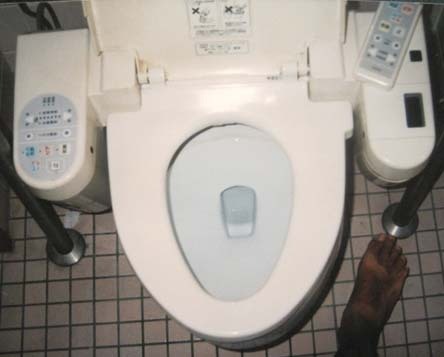 And on the other extreme, a turbocharged Japanese toilet. This is from a friend's house in Kagoshima, Japan. Notice the remote control I placed on the right. On the left is a control panel. I have forgotten or never figured out what most of the functions do. Who would have guessed that a toilet could be so complicated? Rest assured, at a minimum, when you are done here, you are clean. I think I purposely put my foot in the photo to artistically show the contrast between my filthy feet and the ultra-cleanliness of Japan, but I don't really pull it off. Japan has it all. They are absolute masters of all things hygenic. They must have invented the heated toilet seat. I have never seen anything even faintly resembling these high-tech toilets, and I've been around. Can you imagine the average Japanese's reaction when they are on the bus to St. Petersburg and they make a stop in Narva? Maybe the world's most respected toilet. This is from Robben Island prison in South Africa where Nelson Mandela was held. Mandela very likely squatted over this toilet. This is a self-cleaning toilet in Germany in an autobahn gas station.